Terry Johnson has played all over Australia in his short career. He started out in Melbourne with older brother Rod. He played 17 games for the Giants in 1993 where he averaged 2.5ppg 0.9rpg and 0.9apg. These numbers (in limited time) were not enough to secure Johnson a spot on the Giants roster in 1994. 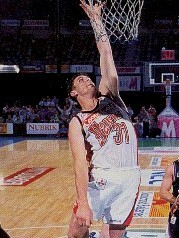 So Johnson went up to Cairns to play in the CBA, that's where the Illawarra Hawks found him for the 1995 NBL season. Johnson rewarded the Hawks by averaging 11ppg 4.0rpg and 2.8apg while becoming the NBL's top three point shooter (47%). Johnson had another good season in 1996 but he still could not crack the starting point guard spot. This was due to Hawks managment's fondness for American Point Guards, (Andre La Fluer, Brian Edwards, Dylan Rigdon). Johnson did not agree with the Hawks policy, he wanted to run the point for the Illawarra hawks, he did not get the chance with the hwks in 1997 and not in 1998 with the Hawks signing American Point Guard, Elliot Hatcher. So Johnson went to Newcastle where he will get the chance to possibly be the starting point guard for the Falcons.